An unfortunate downpour caused the NASCAR Whelen All American series racing to be rained out at Elko Speedway. The only feature event completed was in the Hornets division. Ashley Bell from Lester Prairie (MN) has had an incredible start to her 2015 season, Bell won her first ever Elko Speedway race last weekend and she went two for two this weekend. Ashley’s teammate Justin Schelitzche put a lot of pressure on her the last few laps of the race but he finished second. “It’s fun, of course I want to beat him (Schelitzche) more than anyone else, but its cool that the two cars he built finished 1st and 2nd” said Bell. Fans at Elko Speedway were excited for the debut of the new Hornets Figure 8 division, that race was rained out but some familiar veteran Figure 8 driver names were on the entry list including: John Lebens, Todd Wilson, Troy Tuma, Dan McCarthy, Todd Tacheny, Jack Purcell and Scotty Westphal. The Hornet Figure 8 division will return to race 7 more times in 2015 including next weekend. The ticket stubs from Saturday night sponsored by Whelen Engineering will be honored for admission on Elko Speedway NASCAR nights May 30th or June 20th. Next up at Elko Speedway is an incredible Eve of Destruction night on Saturday May 23rd. In addition to double features the race program will include Dueling Monster Trucks Thunder 4×4 vs Barbarian, Timberworks Lumberjacks, Justinsayne Motorsports stunts, Hornets Figure 8 racing, Terri Traen from KQ92 will be handing out $5 in cash to fans on the concourse and much more. Gates open at 5pm, action begins at 6pm. Get more information by following Elko Speedway on Facebook, Twitter and YouTube, go to ElkoSpeedway.com or call (952) 461-7223. 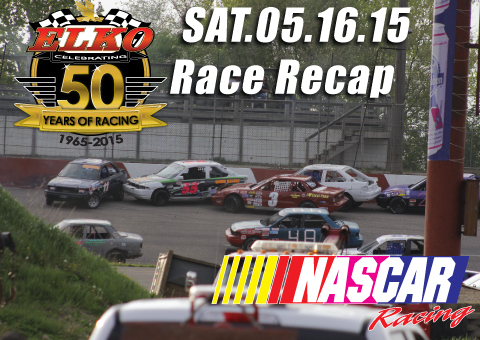 Elko Speedway is celebrating its 50th year or racing in 2015, its located 20 minutes South of the Twin Cities off of I-35 and County Road 2.